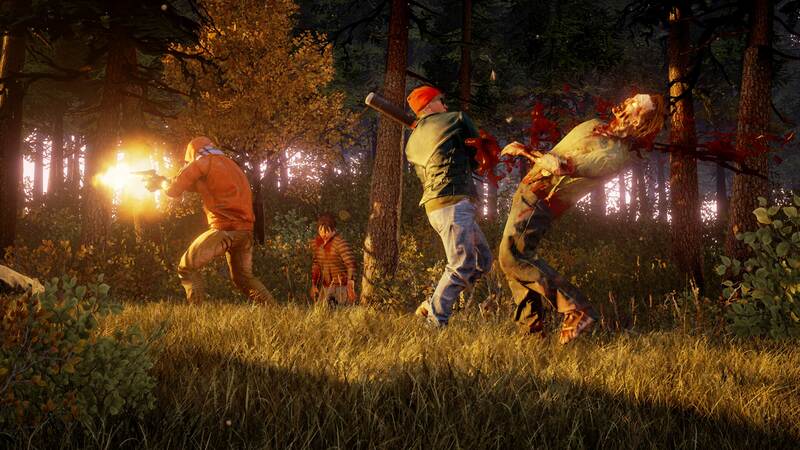 A continued focus on characters and choice ensures State of Decay is unlike any other zombie game around. It’s been a good few years for games starring the undead. There’s The Last of Us, of course, and Sony is also prepping Days Gone. Dying Light is brilliant and, though Dead Rising has lost its way, its brother, Resident Evil, returned to greatness last year. Among all of its zombie-slashing siblings, State of Decay is unique, however – and that’s my favourite thing about it. A focus on survivors and hope is what makes State of Decay stand out. Where other universes descend into the grim darkness of man’s inhumanity to man or zombie-suplexing cheese, State of Decay keeps it grounded and simple. In a bad situation, people band together, though survival is by no means assured. My hands-on session for State of Decay 2 drops me into the game several hours in and in a pretty good situation. My community of survivors is well stocked with ammunition, gas, food, and other crucial supplies. People are actually happy – or as happy as they can get in the midst of a zombie apocalypse. 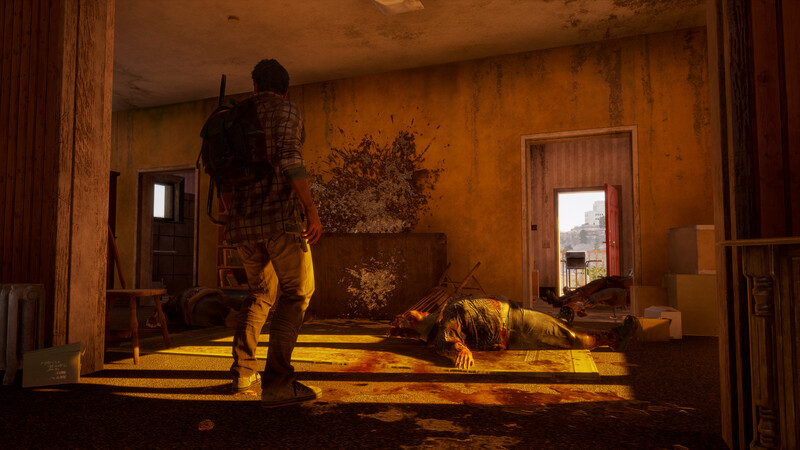 It doesn’t take many of State of Decay 2’s brutal in-game days for things to go awry, however, and when things get bad, they snowball. This is the main hook of the game. The action-game shooting and melee in an open-ended map filled with points of interest is fairly standard issue and familiar – but it’s all contextualized in a structure that’s actually best compared to the multi-character roguelike titles often found on PC. Back at base you’ll have characters to take care of and base stats to worry about. This is a survival game, but in both single player and co-operative play you also have to worry about your community on top of your own survival. When you go out to raid, you’re not just doing so selfishly for whoever you’re playing as at the time, but instead you’re often raiding to take valuable supplies back to base. If you end up with a surplus, you can even push towards upgrades and other buffs, so you’re incentivized to grab as much as you can. “The flow that we have in State of Decay is very self-motivating,” design director Richard Foge explains to me as I’m playing. Foge specifically credits PC roguelikes as a major inspiration for this style of play, and this sort of flow can quickly turn into something really compelling, even in the confines of a limited event where I know save data won’t carry over. State of Decay 2 is at its best when you’re in a panic: when food is low, and you’re haggardly driving a beat-up van across the map to where there’s supposed to be supplies. The challenge is to take out the zombies present, load up the van and get it back to base in one piece – and before people begin to starve. It’s not just hunger you have to deal with, either. A lack of ammo back at base might mean it’s not be fully defended while you’re gone, and survivors infected with the blood plague must be treated, exiled or killed lest they cause problems. There’s a lot to juggle. Out in the field, State of Decay 2 doesn’t scrimp on systems either. It’s ultimately all about noise: zombies are attracted by it, and so you’ll want to only go loud if absolutely necessary. This makes melee and other quiet weapons vital, but it also means coordination in team play all the more important. Things will be easier in a group, since there’s strength in numbers (and the game actively discourages splitting up via difficulty and a cumbersome tethering-to-host rubber banding mechanic), but more bodies can mean more noise and thus a veritable swarm of the undead if players aren’t careful. It’s easy to get overwhelmed. An unforgiving stamina stat means you can be forced to resort to firearms as you become too tired to keep running or fighting hand-to-hand, but doing so only attracts more zombies. At night, the undead are deadlier still and the darkness is an unforgiving mistress – though, mercifully, zombies are not attracted by the glare of your flashlight. The developers experimented with that, they tell me – it was just too broken. You’re constantly on your toes, and if you lose a character that’s it – it’s permanent death. That doesn’t mean game over, however – you then get to take control of another of your survivors back at base camp. Characters grow their stats in different key areas over time and also gain reputation, so losing a high-end character regarded as a hero will have a knock-on effect on both your in-game abilities and morale back at camp. Your other character choices might be less immediately enticing to use, too – maybe a character has lower stamina due to a health ailment, while others might have buffs due to their natural proclivities. This also makes finding other survivors out in the wild all the more important – if you can persuade them to join your little enclave, that’s another body you can hop into and put to use to aid the community. To be clear to newcomers, a lot of these systems were also present in the original State of Decay, though the sequel is revisiting these ideas with a renewed vigor and a much larger sense of scope. The play map is much larger, for instance, and is only one of three open zones that’ll be in the game at launch. The systems feel deeper, more fully connected and thus more bristling with potential. The only issue from my hands-on is a familiar one to open world fans and players of the original State of Decay alike: open world jankiness. Now, caveats abound: this was a non-final build played on Xbox One X development kits, so things could change, but given some of the stuff I saw – physics bugs that went zombies flying, cars getting trapped in geometry before exploding (which, in-game for real, could destroy valuable, hard-earned supplies) and netcode issues that seemed especially suspect given that we were playing in a relatively enclosed environment at an event where lag should’ve been minimal. To be honest, the original State of Decay also suffered badly from this sort of thing but was also the type of game that was worth suffering through the blips to enjoy. The same might be true here, but after four years of development it’s still concerning to go to an event less than a month from launch day and experience so many bugs, connectivity issues and other small problems. When State of Decay 2 was working it was an exciting, enjoyable experience. 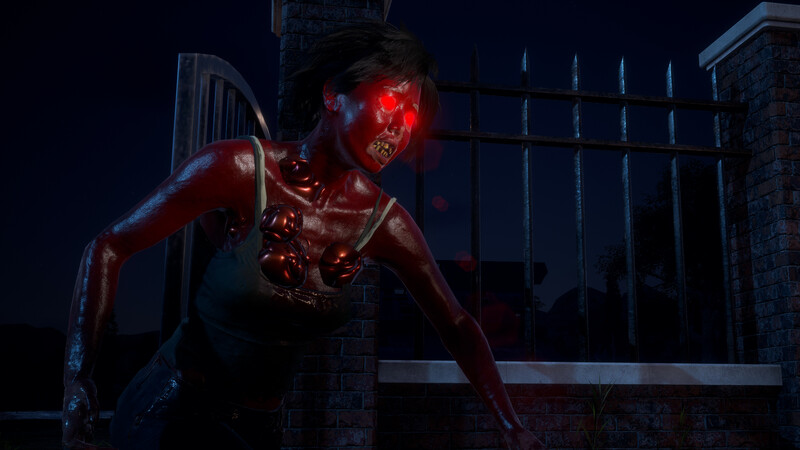 It thrives when you’re under pressure – stamina low, health draining, your character infected with the blood plague after you risked it all to take down a Blood Plague Heart, a sort of zombie spawn point. Destroying it will help your cause, but now you’re in a desperate dash to find the rare ingredients for a plague antidote. The sun is setting and your battered car, missing a door from where a zombie impact ripped it off, is running out of gas. This is when the game thrives – when your heart is pounding and it can truly channel a different sort of terror – not gross-out blood splatter or cheap jump scares, but that real, stressful threat of progress being wiped that’s most often marked by a palm sweat-soaked controller. When it works and these pieces click together, it’s quite an experience – albeit one that I think will still be an acquired taste. Fans of survival games are in for a treat, but your casual Resident Evil fan might find its free-wheeling, open-ended and multiplayer-focused antics difficult to fully appreciate. Here’s hoping that those bugs and problems don’t persist – but even if they do, fans can at least take solace in the reduced $30/£25 price tag. Between that and Game Pass, it’s easy to recommend State of Decay 2 as being worth a try when it arrives later this month.